I've been getting spoiled with a lot of foodies gifts from abroad by friends and family recently. Gifts from the States, Germany, Thailand and more have wound up in my possession making me quite a happy and grateful guy. I can't help but think food gifts are some of the best gifts you can receive from abroad. Of course, I'm not talking the generic cookies and whatnots at the airports but spices, drinks, even "instant" versions of food from that region. It's one of the closest experience you can have in connecting with that region without having actually stepped foot inside... so thank you very much for these goods! My friends have begun joking though with all these global food that I'm accumulating, my pantry is looking more like the foreign food mart now haha. I had the chance to attend the Seoul Coffee Expo at Coex this year. From the beginning I was blown away just how many coffee companies and/or coffee related companies there were in Korea. With hundreds of booths for companies that dealt in everything from coffee machines to beverage ordering systems to takeout cup lids, it was an eye-opening reflection of just how immense the coffee market is in Korea. The oodles of samples were fun to take in. Everything from blended coffee drinks to even a soju coffee (of course) were offered for visitors to try. On the other hand, some of the more questionable drinks I had was a camembert cheese powder smoothie which was gag reflex-inducing.The organization and layout of the expo could have been a bit better but otherwise a fantastic experience. Would highly recommend coffee lovers to go next year! I should have known better than to order a coffee-based drink from Caffe Bene in the first place. I've long known that this local chain has one of the worst tasting coffee ever (although their patbingsu and food items are surprisingly tasty) so I should have known what was coming. However on one particular night I was craving something cold and feeling like I needed some caffeine in the system and, seeing as how the friends I was meeting were already sitting inside a Caffe Bene, I went to order an iced latte (not my usual order but I was hoping the milk would offset some of the cigarette buds-tasting charred beans of Caffe Bene) but was intrigued by an ad for their new "AmeriCoke". Into a tall glass of ice and coke went an espresso shot and a lime slice with the drink advertised as having both a refreshing and multi-flavored taste to it. On a whim, I decided to go for it. One should never order something on a whim, especially at a place like Caffe Bene but alas, perhaps because of the lack of caffeine in my system, my brain obviously wasn't functioning at full speed. My drink was prepared and given to me but looked nothing like the drink in the advertisement and more like the contents of a sludgy pool of water on the street after it had rained. However, even the visual was a step above the taste of this drink I got suckered into paying for. 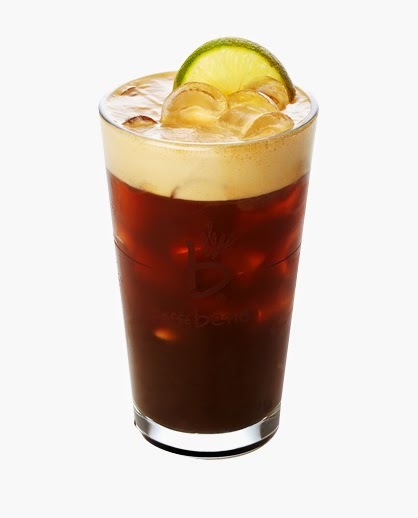 Caffe Bene's infamously burnt and bitter tasting beans clouded the normally crisp taste of an ice cold coke and made it taste like a glass of liquid smoke. Incredibly, all the flavors of the three ingredients- coffee, coke, and lime- played separately but not in a harmonious "kumbayah" of flavors like a mojito but in a mix of tastes that could only be described as "offensive". It was like the three ingredients and their tastes knew they would not get along together and after being forced into a glass together, was taking out their displeasure on the taste buds of the drinker. All five of my friends who tried my drink found their taste buds assaulted. Darned if Caffe Bene's toasts and patbingsu aren't so tasty in a sort of fast food kind of satisfactory way but man, do they also know how to traumatize your mouth too with their other coffee drinks. My roommate and I split costs for things like rice and we recently decided to make a switch over to brown from white rice for better nutrition and health. Aside from the minor inconvenience of having to let brown rice soak in water for a bit longer, I've been really enjoying the switch. Brown rice has a more nuttier and slightly sweeter taste to it that holds well against the bolder flavors and spices of Korean cuisine. However, and this is slightly TMI, I've found a lot of the brown rice seems to be... mmm how do you say... just passing along? ^^;; I've read some people can't digest brown rice properly and feel bloated, gassy, or even constipated after eating it. Those symptoms definitely don't apply to me but I'm just wondering whether this means my stomach doesn't handle brown rice well either. 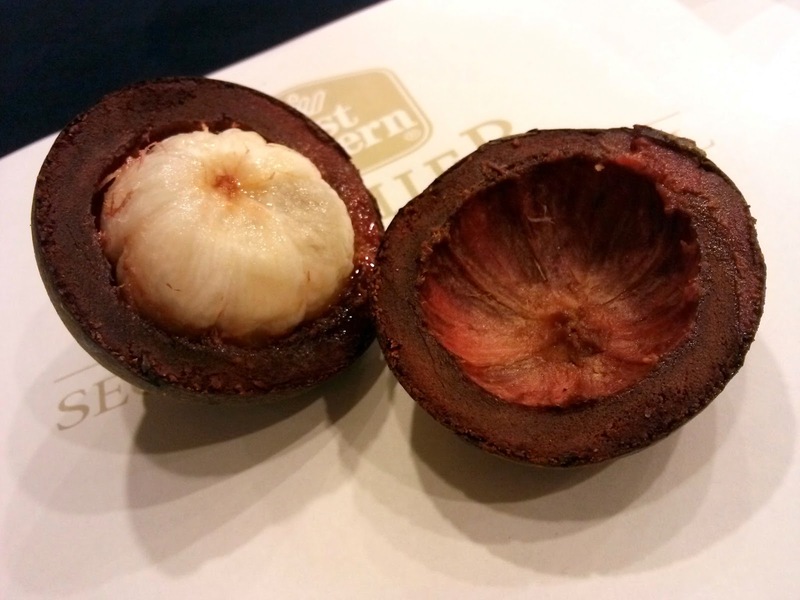 I've noticed many restaurants and buffets in Korea have begun picking up tropical fruits in their selection. Mango desserts are quite popular while I've seen a few places carry passion fruit too! 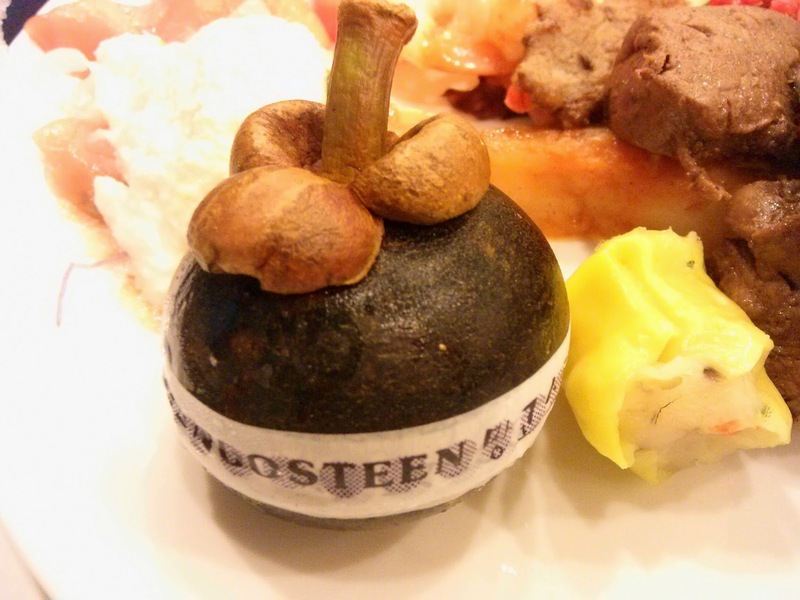 The latest I came across were mangosteens being offered at a wedding buffet of all places. And, even more surprisingly, it was decently ripened!